Editor’s note: This is a guest post by Tom “TNT” Brenneck who’s crazy musical knowledge is enough to fill pages of blogs on 45rpm records . Many thanks Tom. I’ve been a Tammi Terrell fanatic since the first time i saw the music video “Ain’t No Mountain High Enough”. It was love at first sight.. It’s no wonder Marvin Gaye went into hiatus for nearly 2 1/2 years after the tragic death of Tammi. Although they weren’t public with their relationship it’s pretty hard not to see the chemistry between these two, even when they’re just lip singing in a video.I starting digging for more of her music and aside from numerous duets with Marvin Gaye I found only one solo record, Irresistible Tammi Terrell (Motown, 1968). 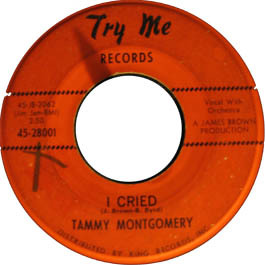 One day i came across the Tammy Montgomery 45 “I Cried” and bought it without making any connection between Tammy Montgomery and Tammi Terrell. I picked it up because it was on Try Me records, which i had never heard of and had James Brown’s name all over it. 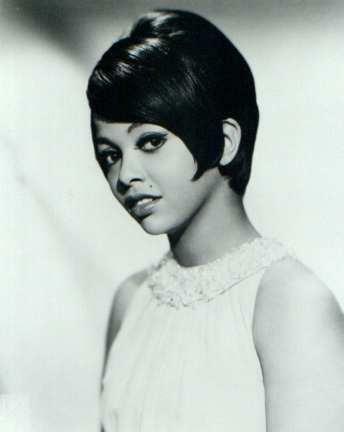 After a listen and some wikipedia i found out that Tammy Montgomery was a 17 year old Tammi Terrell and Try Me turned out to be James Brown’s first independently owned record label. The arrangement is amazing. Stripped down and beautiful, with a crack flute solo throughout that truly adds the flavor of a James Brown production. Tammi’s singing manages to be sorrowful, yet seductive at the same time. Need I say anymore? Give a listen! This entry was posted on Monday, December 1st, 2008 at 5:27 pm	and is filed under Uncategorized. You can follow any responses to this entry through the RSS 2.0 feed. You can leave a response, or trackback from your own site. good one tommy! If there’s anything i know for a fact, is that Tommy “TNT” Brenneck has an immense amount of love for this woman. it always amazes me how such young singers from that era were able to sing with such engaging sorrow. i’m an absolute sucker for it. that was some soulful ish. thanks for the find.